Legend Custom Woodworking is a professional organization dedicated to developing and maintaining successful partnerships with our clients, subcontractors, and associates. Legend was founded in 1984 by Gordon Lundquist and Don Gunstone. Over the past 30 plus years they have built a company that sustains a workforce of more than thirty-five skilled craftsmen. Together with these employees, Legend will maintain your construction schedule and deliver a consistent high quality product. We have extensive experience incorporating all stone, solid surface, metal and glass components. Legend works closely with architects and builders to make their unique designs a reality. This level of service, consistent quality, and dependability is why some of the regions finest work with Legend exclusively. Legend prides itself on our ability to satisfy the emerging demands of Green Building. We use FSC – Certified Building Materials. These products are milled from the timber of FSC-Certified Forests. By using Low or No VOC emitting wood products, we can help our clients achieve LEED Certification. Legend has worked on many of the first LEED projects in the Pacific Northwest. These projects have received Silver, Gold, and Platinum levels of certification. In the past12 years, we have developed relationships with most of the FSC and LEED compliant vendors in North America. Currently about 75% of our projects have LEED components. Legend is a certified manufacturer and installer of architectural millwork and casework with the highly recognized Architectural Woodwork Institute. 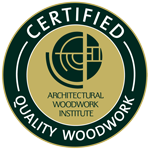 The AWI Quality Certification Program is a valuable quality assurance tool that seeks to ensure that interior architectural woodwork meets the project's specifications and industry standards. Woodworking firms earn certification credentials through the process of comprehensive testing, thorough inspection of completed architectural woodwork, and by demonstrating the ability to fabricate, finish, and/or install work in accordance with the quality grade criteria set forth in the Architectural Woodwork Standards (2009). ©2014 Legend Custom Woodworking Inc.